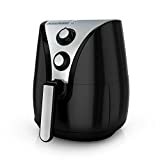 With a capacity of 8 cups and simple cooking functions that only require two dials to operate, the BLACK+DECKER Purify 2-Liter Air Fryer is easily one of our favorite air fryer models out there right now. Unfortunately it’s also quite expensive at $150. If you want to cook up crispy food with a small fraction of the calories you get from deep frying, but you don’t want to spend quite that much, today is your lucky day. Hurry and you can get this great air fryer on Amazon at a $70 discount, dropping the price to just $79.99.